This 5-day expedition takes you into the heart of the African bushveld for an African safari with a difference. Explore the genius of nature in the Kruger National Park, based in Skukuza. Be guided through the expedition by Biomimicry Professional, Claire Janisch, local expert guides from Nsasani Trust and a specialist biomimicry nature guide. Explore the genius of the African bushveld through guided experiences and deep observation activities: including bushveld walks, as well as day and night game drives. WHO SHOULD JOIN THE EXPEDITION? Tourists of all ages wanting an understanding and deeper appreciation of nature’s web of life. Individuals, designers, engineers, biologists, ecologists, architects, entrepreneurs, economists, organisations or businesses wanting to explore the genius of nature in depth to inspire innovation, creativity, a deep reconnection to the genius of nature or a deep appreciation of resilient, sustainable systems that nurture life. Guided and mentored by Biomimicry Professional everyday from 5am until 9pm each day providing you with immersive opportunities to learn biomimicry, and receive guidance and mentoring on how to integrate it into your life and/or your field of work. Private biomimicry field guide with you each day giving you deep insight and understanding of the African bushveld, especially on walks and game drives. Local South African National Parks guides with you on bush walks. Local ecologists and life scientists from Nsasani Trust providing additional guiding and insight on walks/game drives. A rich library of resources at the venue to expand your learning. 3-levels of Biomimicry training plus additional tools: including biomimicry101, biomimicry Life’s Principles and the Genius of Nature - including practical applications through design challenges. 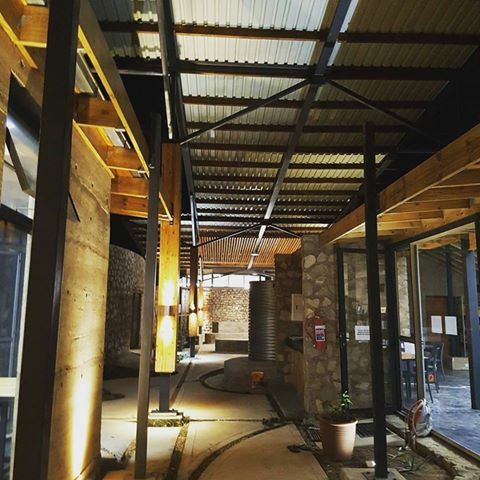 Our base is in an award-winning Green Building that is a living example of biomimicry applied. A bush camp dinner under the stars in the wilds of the Kruger National Park and an opportunity to camp out one night in a bush camp - surrounded by the sounds of the African bushveld - and chances to spot nightlife. An extraordinary opportunity to network with curious and passionate people from around the world with similar interests in biomimicry. Support in terms of logistics and assistance with any travel and daily queries. An experience of a life-time that has been consistently rated as 10/10 (Excellent) by all participants. This entire package is valued at >R25,000pp and offered at an exclusive rate of approx R20,000pp (for the last time) in 2019. In order to encourage the participation of locals in these expeditions, biomimicrySA together with Nsasani Trust offer a heavily subsidised discount of 40% for local South Africans. There is nowhere else in the world where you can receive this level of biomimicry training and this kind of experience at this rate. NOTE THAT INTERNATIONALLY BIOMIMICRY EXPEDITIONS ARE IN THE RANGE OF $2500pp. This is the best value for money expedition globally with world-class experience and training. Cost: Prices for April expedition: International rate: US$1400/person, Local rate (South African) R12,150/person including tuition, game walks/drives, workbooks, all meals and some beverages. Accommodation is costed separately. If you choose to stay at Nsasani Trust centre in dormitories and huts sharing 2-3 per room max, accommodation is: ZAR600/locals and $100/internationals for 4 nights in total. (i.e. total including accommodation = R12,750/local person and $1500/international person. Alternative accommodation: If you choose to book your accommodation separately at Skukuza main camp, please do this yourself and let us know where you will be staying. You can book through this link: https://www.sanparks.org/parks/kruger/camps/skukuza/. Late entry permits will then also be required for you at an additional cost. LOCALS: email info@biomimicrysa.co.za for an invoice. Note that payment plans available for locals and discounted rates are available for students. EARLY BOOKING DISCOUNT OF 10% off total price- if book before 23 January 2019. Practical biomimicry training and activities, including Biomimicry Thinking & Methodology, Life's Principles, Genius of Place, iSites and solving design challenges using both Biology to Design & Challenge to Biology processes. *Does not include: travel to Skukuza Kruger National Park, accommodation, travel & medical insurance, items of a personal nature, additional beverages. NOTE that you will need to make your own arrangements to travel to Skukuza. You can either drive there or fly to Skukuza airport and organise a transfer to the camp. To the west and south of the Kruger National Park are the two South African provinces of Limpopo and Mpumalanga. In the north is Zimbabwe, and to the east is Mozambique. It is now part of the Great Limpopo Transfrontier Park, a peace park that links Kruger National Park with the Gonarezhou National Park in Zimbabwe, and with the Limpopo National Park in Mozambique. To the north and south of the park two rivers, the Limpopo and the Crocodile respectively, act as its natural boundaries. To the east the Lebombo Mountains separate it from Mozambique. Its western boundary runs parallel with this range, roughly 65 kilometres (40 mi) distant. The park varies in altitude between 200 metres (660 ft) in the east and 840 metres (2,760 ft) in the south-west near Berg-en-Dal. The highest point in the park is here, a hill called Khandzalive. Several rivers run through the park from west to east, including the Sabie, Olifants, Crocodile, Letaba, Luvuvhu and Limpopo Rivers. All the Big Five game animals are found at Kruger National Park, which has more species of large mammals than any other African game reserve (at 147 species). There are webcams set up to observe the wildlife. Out of the 517 species of birds found at Kruger, 253 are residents, 117 non-breeding migrants, and 147 nomads. The park has nine main gates allowing entrance to the different camps. Skukuza, located 50 km east of Hazyview in Mpumalanga, is the capital city of Kruger National Park as well as being the administrative headquarters and main camp of the Kruger National Park in South Africa. It is the largest rest camp in South Africa and also the largest rest camp in the Kruger National Park. It is situated in a high rainfall area, well wooded and thick dense forests of the southern banks of the Sabie River in Mpumalanga Province. Skukuza is located in the southern part of Kruger and is the most popular and accessible camp, and one of the best for game viewing. The expedition will be based at the Nsasani Trust Science Leadership Centre within Skukuza. The Skukuza Science Leadership Initiative is an inspirational and sustainably-built learning space in the Kruger National Park. 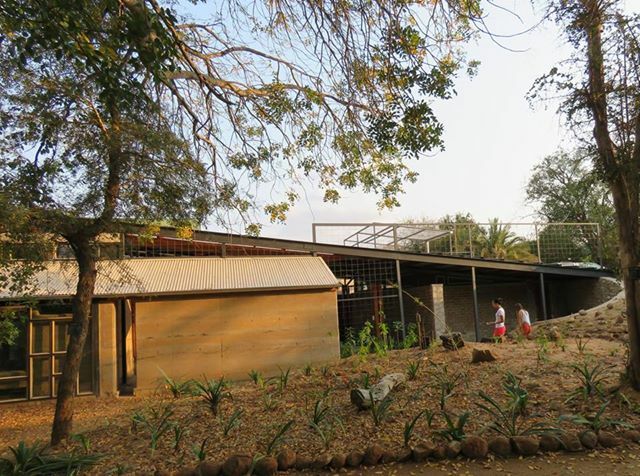 A flagship Green Building centre for the KNP, the facility not only enhances science education and experiential learning opportunities, but demonstrates to managers, tourists and students alike, the feasibility of low impact living by showcasing the ways in which design and materials can reduce our environmental footprint in all aspects of daily living. There is no better place to ensure that our advances in human development are achieved while bearing nature in mind than in South Africa’s premier natural destination itself. During the day and night we will make a number of walks or game drives into the Kruger National Park to explore the genius of nature through the lens of biomimicry. Accommodation at the venue includes: 3 rooms with 2x single beds, one ensuite room with a queen bed, one room with 8 bunk beds, and one room with 6 bunk beds. These are inside comfortable houses. Then there are also 2 wooden wendy cottages with 4x single beds with access to outside toilets and showers. You can choose to stay here at low cost, or book your own accommodation at Skukuza main camp. Skukuza main camp has camping and bungalow options available. All meals are catered for and will be served at the Nsani Trust Science Leadership Centre.